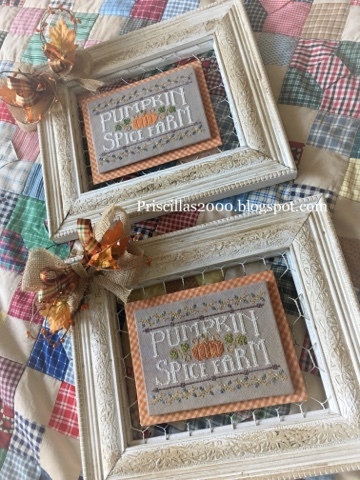 My daughter Chelsea and I both received this new Pumpkin Patch farm chart from Cathy at Hands on Design .. so we both started and finished it! We dyed light grey 28 count evenweave with brown Rit dye.. we didn't love it so then it got put in a pot with tea and coffee .. It turned out perfect.. I used all Classic Colorworks flosses and Chelsea used DMC except for the purple/ grey lines ..those are in Classic Colorworks Rod and Reel..Her husband made us the frames with molding and chicken wire.. Chelsea painted the frames and dark waxed them..I mounted the stitched piece onto a piece of sticky board and used some tea dyed orange gingham for the backing. 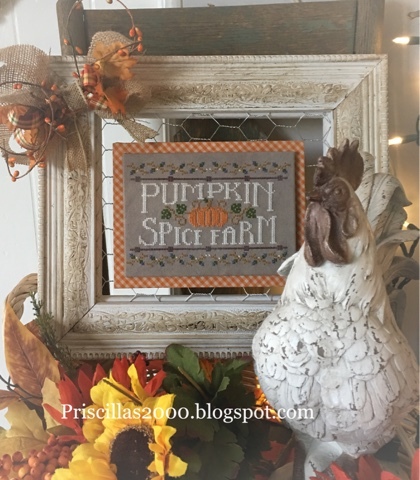 We used magnets and sheet metal so we can reuse the frame for another season.I made the bows with burlap, plaid ribbon, wired berry branches and fall leaves..
this weeks floss tube video..
Priscilla, you and Chelsea really inspire me to think outside the box with my finishing. Thank you for being so generous with your creativity. I now have this pattern on my wish list. Love this pattern! It is a good one for October and November! Love the way you finish your cross stitch!! 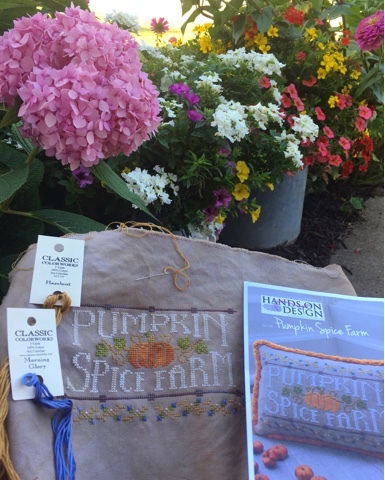 Two fabulous finishes to celebrate the season of pumpkin spice! I like the frames fixed with the chicken wire. Enjoy your day! Pretty and so creative - another win! 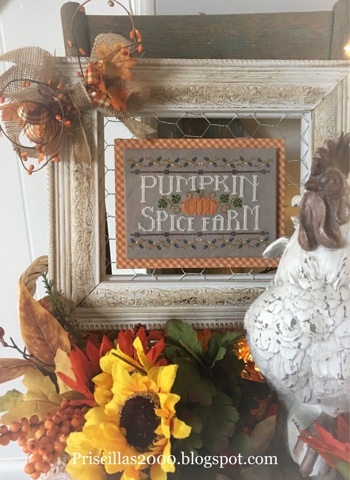 LOVE the chicken wire frames! I just discovered tubefloss and it's so much fun to listen to you and your daughter. Thank you for sharing for so many creative ideas! Love the design, love the finishes.Perfect. You all need a craft booth! Very lovely finishes and cute design:).